Here’s an interesting article in the print edition of the Los Angeles Times that was hard (if not impossible) to find on their website. I wrote to the author and got him to send me the link. At the Henry Fonda Theater on Hollywood Boulevard last night, YouTube introduced its new “Screening Room,” an area of the site devoted exclusively to selected independent films. The Screening Room will feature four short films every two weeks, as well as the occasional full-length feature. The first several slates of films are chock-a-block with recognizable names and Academy Award-nominated filmmakers, but as the program continues, YouTube expects to include films submitted to a kind of cinema slush pile, to keep at least a modicum of the “You” in YouTube. The first four films showcased both the flexibility of the short form and the way it seems to lend itself to limited-attention, online viewing. “The Danish Poet,” a precious animated love story by Torill Kove, won the 2007 Oscar for best animated short, and the mind-bending puppet opera “Love and War” won the same award at last year’s Los Angeles Film Festival. Miranda July’s “Are You the Favorite Person of Anybody?,” starring John C. Reilly, represented Wholphin, the quarterly DVD magazine from McSweeney’s. Rob Pearlstein’s “Our Time Is Up,” starring Kevin Pollak, was nominated for an Oscar in 2006. In a panel session after the screening, the filmmakers talked about the potential upside of having their films on YouTube. “It’s difficult to get a mass audience for short films via the film festival route,” said Pearlstein, speaking of YouTube’s (theoretical) capability to focus millions of eyeballs on these shorts in a way that Sundance, say, never could. Films shown on the (virtual) Screening Room will be eligible for YouTube’s revenue-sharing program, whereby filmmakers split some of the income from the advertising that accompanies their movies. YouTube never says much about what this can amount to, but stories circulate about the odd person who can make a living by stringing together enough million-plus-hit video clips. I’m not ready to believe that this project is going to allow thousands of auteurs to hang up their Starbucks aprons and start cranking out movies. 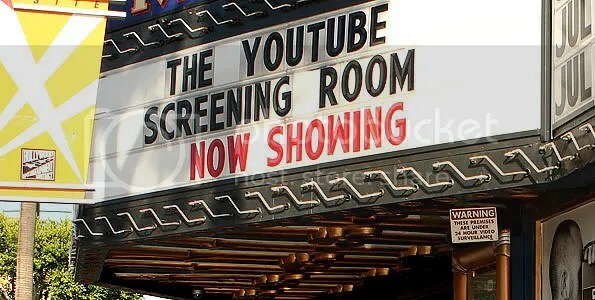 And though the Screening Room’s debut was mostly flash and hype (three of the four films still have fewer than 500 views), there was a definite sense that YouTube had set up its first serious outpost in the world of cinema, and that more than a few of us are going to be watching.